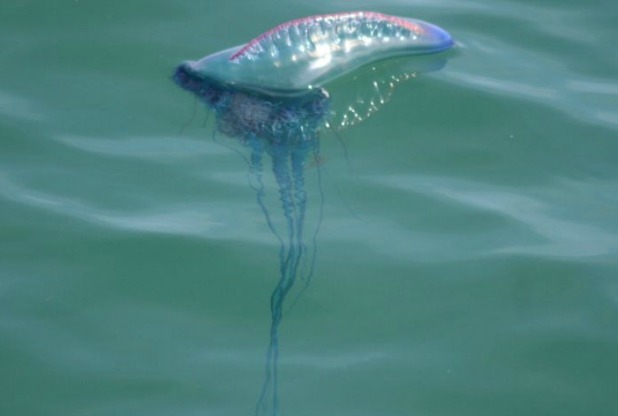 The Marine Conservation Society (MCS) has received reports of the lethal Portuguese man-of-war washing up on beaches in Cornwall and the Scilly Isles, despite them usually being found in the Atlantic, Indian and Pacific oceans. The species, often mistaken for being a jellyfish, is actually a siphonophore, which is an animal made up of a colony of organisms working together as one. The stinging creatures have tentacle-like polyps which can reach up to tens of metres in length. If stung by them, it can be extremely painful and, in some extreme cases, fatal. Peter Richardson, spokesman for MCS, told Sky News: 'A stranded Portuguese man-of-war looks a bit like a deflating purple balloon with blue ribbons attached, children will find it fascinating. One of the lethal animals was spotted at Portheras Cove, near Morvah, Cornwall, by volunteers of the Friends of Portheras Cove environmental group while cleaning the beach. Delia Webb, a group member, said the creature was found among plastic debris. Reports of lethal Portuguese man-of-war washing up on beaches in Cornwall and the Scilly Isles in the UK is yet another indication of climate change and how it affects the vulnerability of the delicate eco system. Portuguese man-of-war are known to reside thousands of km's further south in the warmer waters of the Caribbean Sea, Indian and Pacific Ocean. The UK and Europe have witnessed an incredibly warm August and September which could account for this species being so far north. Humanitarian crisis looming in Garissa County Kenya following persistent drought that has affected thousands of families and their animals.